Home Art+Culture How Do I Become … a Wax Sculptor? While Kate Winslet waits for a glossy makeover, Britney Spears is having her hair tonged. Near by, Cristiano Ronaldo’s ear is getting some attention, and at the end of the table Jackie Chan has just arrived for Chinese new year. This is the maintenance studio at Madame Tussauds in London, where ageing models of some of the world’s biggest stars come to be rejuvenated by the principle wax sculptor, Stephen Mansfield, and his team. For the past 15 years, Mansfield, 48 and from north London, has been sculpting celebrity wax figures for Madame Tussauds at its west London studio, where brushing shoulders with celebrities is part and parcel of the job. Previously, he worked on the visual effects for the puppet show Spitting Image and freelanced for the BBC sculpting severed heads of statues. His most recent wax figure was Zayn Malik of One Direction. The ubiquity of the chart-topping boy band increases the pressure to get it right. “If all I had to do were wax figures of unknown people, it would be easy. But everyone has an opinion on them from all over the world. You can’t take your foot off the pedal, it’s an intense process”, Mansfield says. A process that takes four months and £150,000 before the grand launch of a newly finished wax figure. The clay head is made 2% bigger than actual size because the mold shrinks when the beeswax is poured in. The head is then cleaned to get rid of the seams while the eyes and mouth are burnt out for the acrylic teeth and eyeballs. Striking the right pose is done on a turntable with a framework of steel rods helping to build an armature. These are then padded out with newspaper and held in with chicken wire until the clay is built around it. In the age of the selfie, the wax figures are positioned to lend themselves to visitors hugged up with them. “None of the figures are behind ropes like they used to be. They are designed to be posed with and people automatically do it,” Mansfield says. The process is collaborative. “There are 20 people with different specialties working on one figure. As a principle sculptor, I have to sign off other figures at various stages other than the ones I am working on, so there is a lot of responsibility,” Mansfield says. 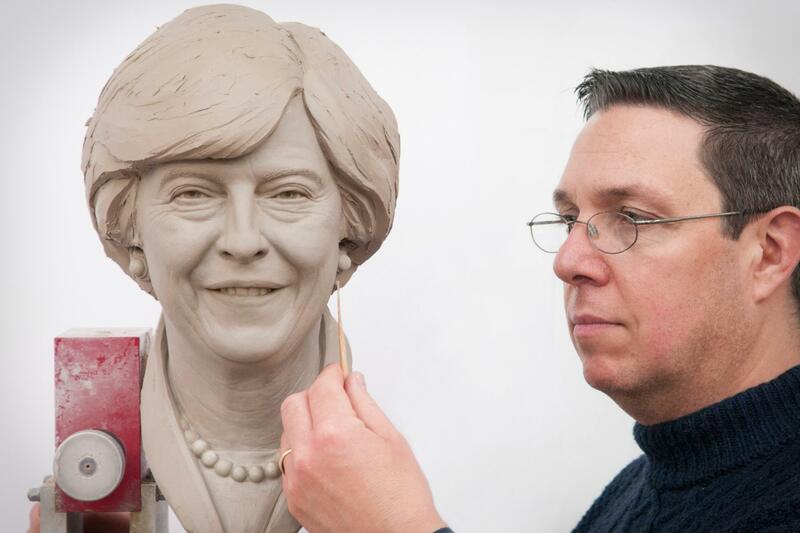 A junior sculptor entering Madame Tussauds can expect to clean the wax heads after moulding, and then eventually start working on the bodies and attending sittings. The senior and principle levels work on elaborate heads and sign off other work. Contrary to popular myth, the wax figures are never melted, “so Britney Spears’ head doesn’t become Kylie Minogue’s arm.” Mansfield says they are all kept in the archives. Scanning the exhibition rooms, Mansfield says that some figures are due for an update. Some politicians are captured in a “pre-entering office” moment when the deep-set wrinkles triggered from the stress hadn’t quite surfaced yet. One of those on display is Boris Johnson, and Mansfield points out that the wax figure’s trousers have a noticeable slash on the bottom. “He was a good laugh. He was wearing the suit he’s dressed in at Madame Tussauds on the day he came for the fitting. When he arrived he caught the trousers on his bike, but we kept it because it was authentic Boris,” he says. Previous articleWhat Ingredients Make Soft Drinks Dangerous?